Thanksgiving was fine. My food sobriety is clean. No sugar, no hidden exceptions. No unplanned eating and no secret food or evasion. THANK GOD for that because there is too much going on to be mired down in food issues. My daughter in Florida is having a biospy and wants her mommy with her and my daughter in NY fell down the stairs and requires surgery on her leg and wants her mommy with her. Here is the diagram of the two bones involved. Ingore where it says 'fracture.' That is nothing like hers. 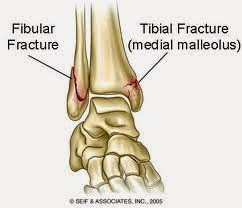 As you can see in the photo, she completely displaced her tibia and the fibular is splintered. The doctors at the hospital look at the rays and say "this is bad." Isn't that cheery? Recently Vickie posted how she could not imagine not being with a child who is about to undergo surgery. I agree completely. But what do you do when you have two children, 1200 miles apart and both need you at the same time? And you own your own business and the livelihood of others is dependent on you working? It is a horrible nightmare. Just after Florida Daughter's procedure is done I will be at the airport getting on the plane to New York daughter. It is going to be a long recovery processed. She is very independent but lives in a three story walk up and takes multiple subways with stairs, ice, snow . . . do you see how that is not going to work with this injury? I do not know when I will post next but will update when I am able. Safe travels and keep yourself well, no matter what or how hard it gets. My husband has been handling one daughter and I the other. I identify 100%. I have the sicker of the two. I am on week five with her. Very tough. Hope the biopsy goes well. They are very scary. I understand why she needs you. X-ray looks DREADFUL. Understand why that one needs you too. Write when you have the chance. Hopefully your employees can carry on with you long distance. I recommend a knee walker for your daughter. Won't be something for stairs but all places have to be wheelchair accessible right? It was a life saver while I was in my cast. I got it on amazon for less than $200. It was definitely better than crutches in the winter. Good luck to your family Jane, I feel for you, thinking of you all during this tough time. If she lived somewhere else, I would suggest she move, but I don't know how practical that is in NY. Can you bundle her back to Florida for a while? Knee walker is good suggestion if she has to keep all weight off it. You are a very strong woman. Your daughters are lucky. Draw comfort from above. I wish you strength and peace in this difficult time. In NY city by now? How are they both doing? Things better (or worse) by now?